back in october my friend robert came to visit. he'd been working like a dog fixing people's mac's and desperately needed a vacation. after a few months of begging, he finally flew out here. i had a whole weekend of nerdy awesomeness planned: comic book stores, video game stores and of course, lego land!!! there are a few trips i have yet to make since i've moved to ca: wine country, comic-con and lego land. when comic-con finally rolled around last year, and again i couldn't go, it was made only more depressing by the announcement of the exclusive lego delorean. i wanted one sooo badly. i begged everyone i knew who was going to bring one back, sadly they sold out. jump to october while planning things to do with robert, the delorean was in stores. we made a plan, go to lego land and buy the deloreans there. 4 hours and 5 lego land stores later, we left empty handed and began the process of calling every lego store between san diego and glendale to see if they were in stock. we managed to find some in san diego, day saved! it's pretty awesome, not overly designed and comes with all 3 body kits. i chose the flying delorean (i mean, you kind of have to) with marty on his skate board. back to the future is my favorite in the series, possibly all time. but if you're going to have a time machine, it kind of has to be a flying time machine. doctor who, bill & ted, the uss kelvin going thru that worm hole in the star trek reboot to create the alternate time line. 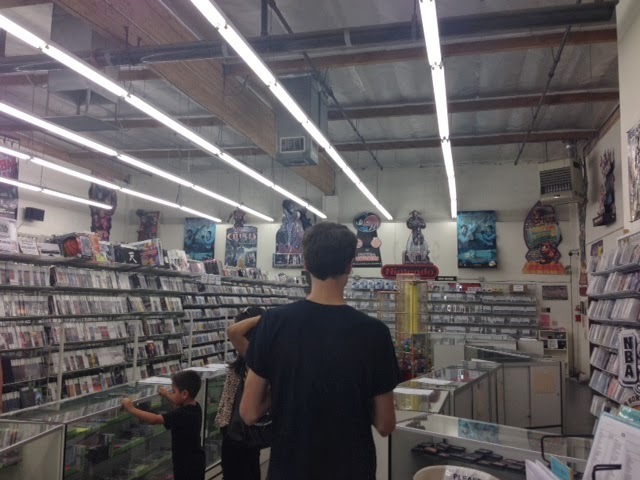 in addition to lego land we hit up game dude. it's got nearly every game you can think of, new and used. i say nearly b/c they didn't have incredible hulk: ultimate destruction for the xbox 360 or ps3. robert picked up marvel ultimate alliance 2. it's super fun. we had our own little co-optitude over a jar of apple pie moonshine that night. we also made the comic book rounds. 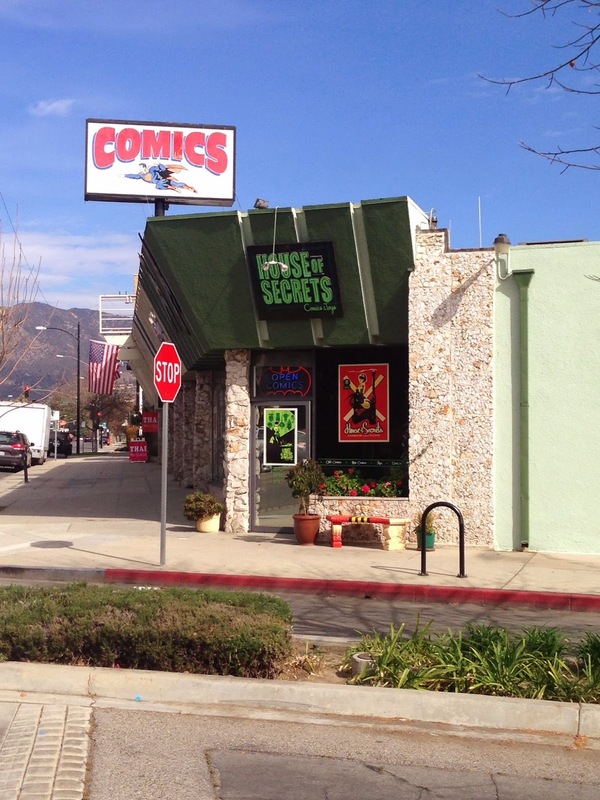 i had picked 3 stores to stop by: meltdown (los angeles), dreamworld (culver city) and house of secrets (burbank). meltdown is pretty cool. 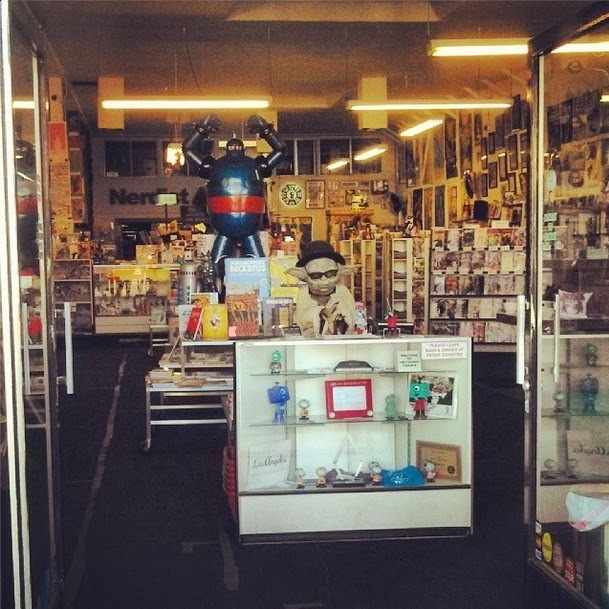 it's huge, has tons of collectibles, hosts dnd games on the weekends and is also the home of nerdist podcast. sadly i haven't had much luck with the staff there. after missing a signing for hope larson's a wrinkle in time i spent 6 weeks constantly being told "we'll get it next wednesday" only to have it never arrive. on this particular trip, we totally struck out on nearly everything from new releases to past issues to trade paperbacks. dreamworld is close to where i live. i like that it looks like the quick stop from clerks. it's pretty small but has a decent selection. again, the staff is the draw back. when i showed up to pick up the dark horse star wars tpb they were clueless as to what i was talking about and even tried to convince me i was mistaken about what i was looking for. turns out, it was socked in the wrong place and i found it on my own. when i asked if they were able to order a wrinkle in time they took down my info and said they'd call, the call never came. the last time i stopped in to pick up the #0 harley quinn i also grabbed a spongebob for my cousin. when i approached the counter the clerk said in a rather snarky tone "i figured you were coming in for the archies, hehe." we didn't make it here after all, darn. house of secrets is my new love. i don't care that it's a 30 min drive from my apartment, it's totally worth it. the store is small but packed wall to wall to ceiling without feeling like you're navigating a trader joe's. i've gone on different days and the staff is always friendly and helpful. 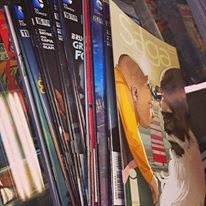 robert and i left with about $200 worth of comics between us, total score. house of secrets is the home of amy dallen, one of the most adorable nerd girls ever. you can see her weekly vlogs for geek and sundry. every time i watch one of her posts, it ends up costing me money, but i don't care. while he was here robert managed to get me hooked on a new series, saga by brian k. vaughan. vaughan also wrote y: the last man, which i devoured in 2 days. vaughan has also written for the buffy the vampire slayer series. i'm so impressed by how different each of the worlds he writes are. y: the last man reached the "freaky science accident" part of my soul while saga reaches the "aliens are real, watching us and laughing" corner. my attention span is pretty short so i tend to wait for the trade paperback printings. going a month between single issues is really hard. "run with the herd" or "virtually there"